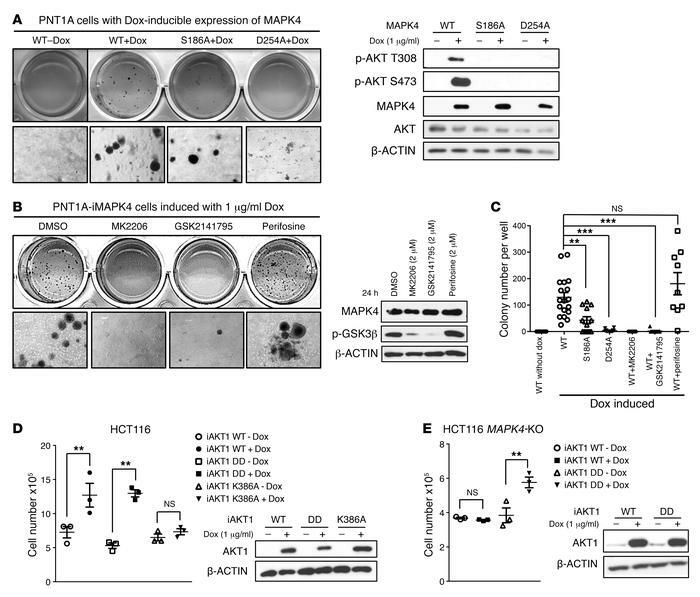 AKT activation is crucial for mediating MAPK4 tumor-promoting activity. (A) Soft agar assays comparing the anchorage-independent growth of PNT1A cells with Dox-induced expression of WT MAPK4 (WT+Dox), MAPK4S186A (S186A+Dox), and MAPK4D254A mutant (D254A+Dox). The PNT1A-iMAPK4 cells without Dox induction (WT-Dox) were used as control. Higher magnifications are shown in the bottom panels. Original magnification: ×50 (A and B). Western blots were used to confirm comparable levels of Dox-induced MAPK4 expression, and for detection of AKT phosphorylation. (B) Soft agar assays comparing the anchorage-independent growth of the Dox-induced PNT1A-iMAPK4 cells under different treatments as indicated. Western blots were used to assess AKT activation status (phosphorylation of GSK3β) in these cells. (C) Quantification of colony numbers in the soft agar assays in A and B. The group labeled WT contains both the WT+Dox group in A and the DMSO group in B. The q values were calculated and used to account for the FDR in the multiple comparisons (32). No test was applied to the WT+MK2206 group because no colonies were found. Data are mean ± SEM. **q < 0.01, ***q < 0.001. (D) Cell counting comparing the proliferation of HCT116 cells with (+) and without (–) Dox-induced expression of WT AKT1, and the T308D/S473D (DD) and K386A mutants. Western blots were used to confirm comparable levels of induced AKT1 expression. (E) Cell counting comparing the proliferation of HCT116 MAPK4-KO (KO, clone 4) cells with (+) and without (–) Dox-induced expression of WT AKT1 and the T308D/S473D (DD) mutant AKT1. Data are mean ± SEM. P values determined by unpaired 2-tailed Student’s t test. **P < 0.01. Western blots were used to confirm comparable levels of induced AKT1 expression. Data are representative of at least 3 independent experiments.